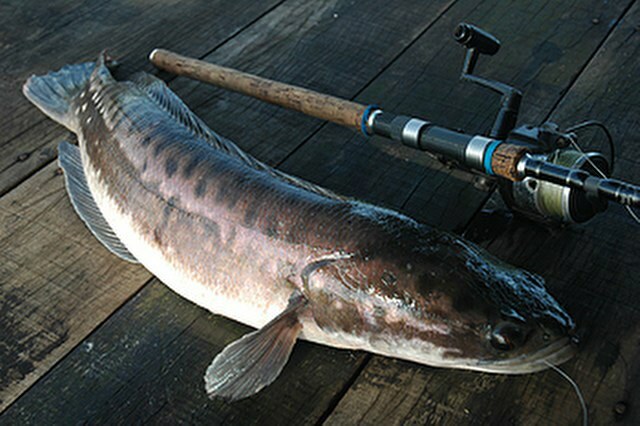 The Giant Snakehead, Channa micropeltes, is the largest in the family Channidae, growing to 130 cm in length and a weight up to 20kg (44 pounds). 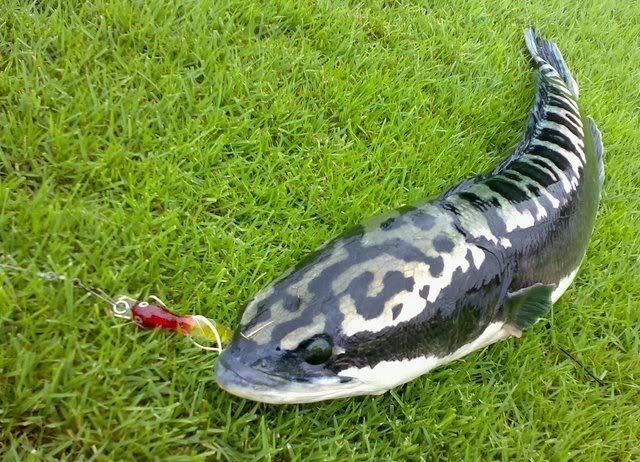 The Giant Snakehead is native to Thailand and it is widely distributed from India to Vietnam. In Malaysia and Indonesia they are called Toman, the common Thai name is Pla Shadow. Occurs in lowland river and swamp, usually associated with deep water bodies like the big hydro power reservoirs of South-East Asia. Also found in large streams and canals, with standing or slowly flowing water. Feeds mainly on fish but also takes some crustaceans and frogs. It spawns in small streams with dense vegetation. The Giant snakehead build a nest to lay their eggs in, and will attack anyone who comes too close. 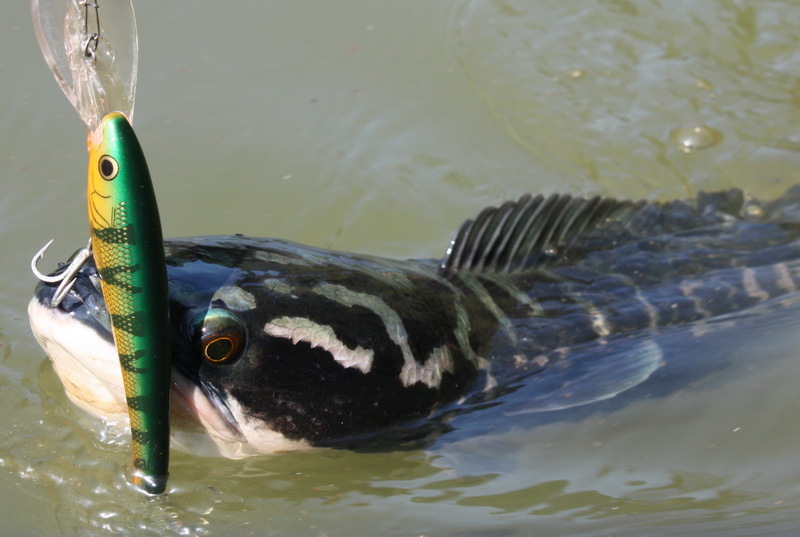 The Giant Snakehead is a savage predator, and the Asian equivalent to a pike or a bass. They are aggressive fish that will take Surface lures, deep diving wobblers, spoons and even flies with ferocity! It will dive straight for the nearest snag or cover, their strong hard mouths and constant head shaking mean that these fish are the ultimate challenge for serious predator anglers. As long as a full-grown person and weighing as much as a 5-year-old child, the giant snakehead is not only the largest member of the snakehead gang, but also the most violent. 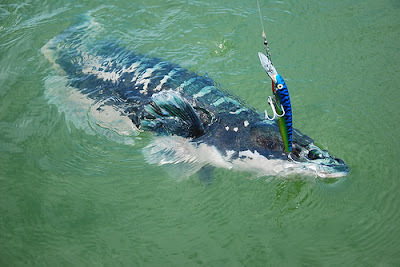 In Southeast Asia, there are stories of this fish attacking people unprovoked, especially during the breeding season. Giant snakehead parents aggressively guard their spawn, which is unusual for a fish. The father corrals and guides the fry while the mother patrols at a distance, ready to voraciously attack anything that looks like a threat even something as large as a person. There are around 30 different species of snakehead, ranging from the tropical Africa to the Far East and Russia. All are predators with streamlined bodies, sharp teeth and a reputation for extreme aggression. Snakeheads are also air-breathers. 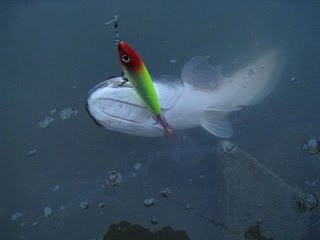 The fish will come to the surface, lift its head up, grab a mouthful of air and then submerge. The oxygen diffuses directly into a dense network of blood vessels encircling its swim bladder, an organ that doubles as a simple lung in snakeheads. This allows the fish to survive in stagnant areas where oxygen levels are low. It can even walk on land, using its soft pectorals to drag itself to new locations. It's said a snakehead can survive out of water for up to 4 days. Live baiting with Toman is also very popular. It has sharp teeth of the use of a short wireor heavy mono track is necessary to ensure that the system can not be severed. Bait ofwhole fish or strip can also be used. 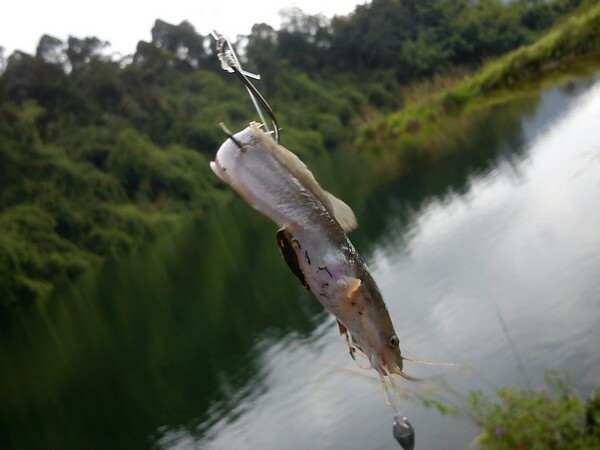 Other baits such as catfish and chicken intestineare frequently and successfully. to avoid breaking your leader.